I bought a brand new Volkswagen jetta from kamloops from JM, the manager. It needed a new rear view mirror, I phoned JM the same day, he told me he would order it. I went out of town for 2 weeks and I have been home for 1 week. Still trying to get a mirror, they tell my dad that they dont have one, they dont know if they can get one in. That is ridiculous, you buy a $26,000 car you except to be able to see pit the mirror. Neither JM or Paul, the service manager have returned my calls. They were awesome til I bought the car, now the dont care about me, went to volkswagon canada and BBB. This is not right!!! Update: I finally got a hold of Terry Lowe, the owner, and told him of everything that happened with JM and how badly I was treated. He apologized, and he fixed the mirror. Terry has been great, which I appreciate. Terry communicated with me, which is all I wanted. Now, we can drive the car and not worry about getting into an accident. Thank you for caring and taking care of the safety issue Terry, now we are safe!!! I broke down on a road trip from Calgary to Vancouver, never a pleasurable situation but luckily I was not far from Kamloops and hobbled in to town. These guys got my car up and running again and Angelo kept me in the loop every step of the way. Even months later when I had questions about the repair he got back to me promptly with the information I needed. 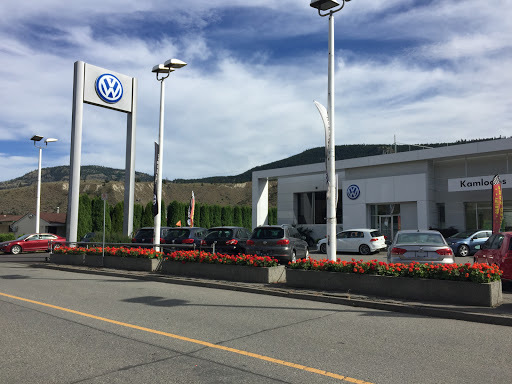 Thanks Angelo and VW of Kamloops for excellent service. Kudos to Trevor in the Service Department at Volkswagen of Kamloops. He got us back on the road again after a breakdown 100 km outside of Kamloops. He handled getting vehicle towed into shop, ordering the part overnight and all the paperwork for the warranty work. Vehicle was repaired and back in our possession the next day. He made it all easy. Exceptional service! Great sales guy, Ryan, no pressure - showed us the used car and most features. When buying a used car - find what accessories are missing prior to purchase. Negotiating with this dealership after the sale for missing items is futile. Heinrich and his team were extraordinarily helpful to us in dealing with our road trip mechanical issue. He went above and beyond for us - a really reasonable guy and great VW dealership experience! Thank you. From service to sales, I felt entirely looked after and treated with respect. Thanks to Angelo in the service department, Duncan in sales & James the finance manager. Very professional. Fantastic service! Very polite and helpful. Ill definitely be buying my next car here if only for how they treat clients! Absolutely outstanding customer service from both the sales team and the service department. Service was great, and of course they sell top cars!